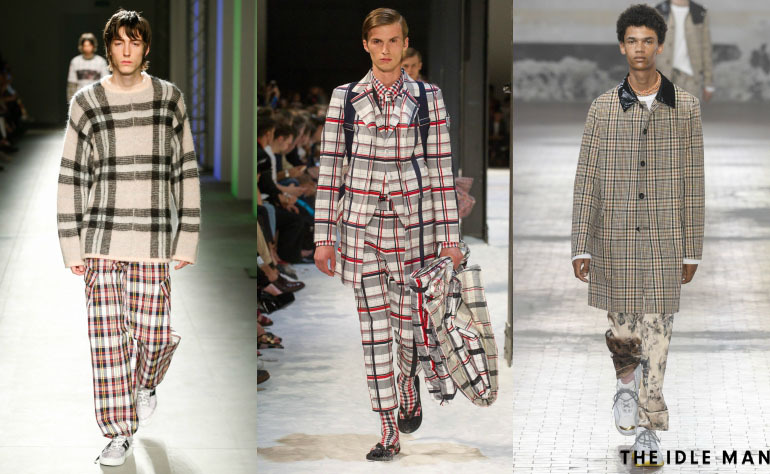 After London Fashion Week Men’s ended, next destination is Italy. We talk about Pitti and Milan Fashion Week Men’s. 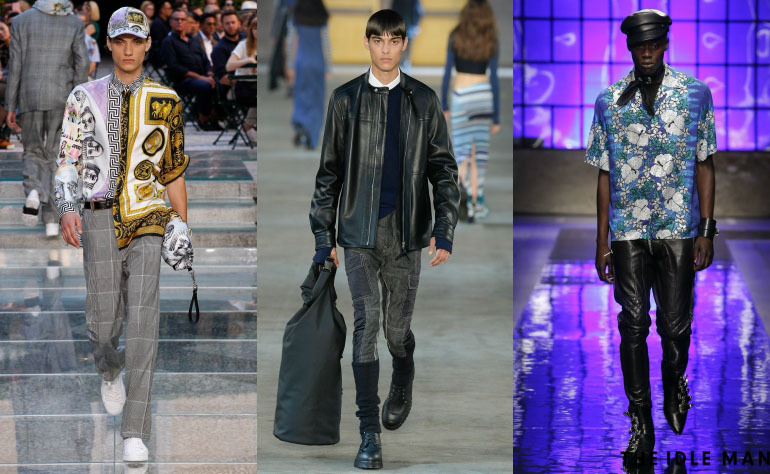 And we’ve spotted on the catwalk at the Milan shows for Spring/Summer 2018, these are the top trends from runway that will become big trends for men. You may have been told that pink was a seasonal colour and that next season you wouldn’t be wearing it. If you were, then think again. Pink is here to stay. Versace gave us head-to-toe millennial pink looks and Tom Ford mixed up his tailoring and teamed dusty pink jeans with pink suit jackets and fuscia pink V-neck sweaters. Meanwhile Ermenegildo Zegna gave its suiting a splash of it. 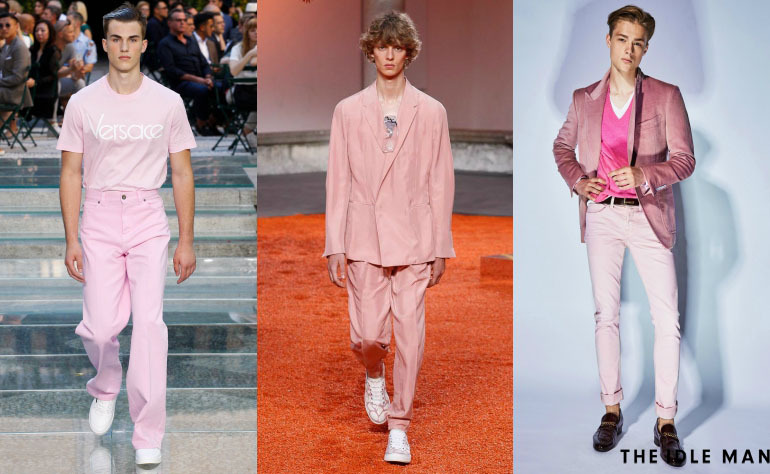 Pink is now an embedded part of men’s fashion and it’s about time you embraced it. 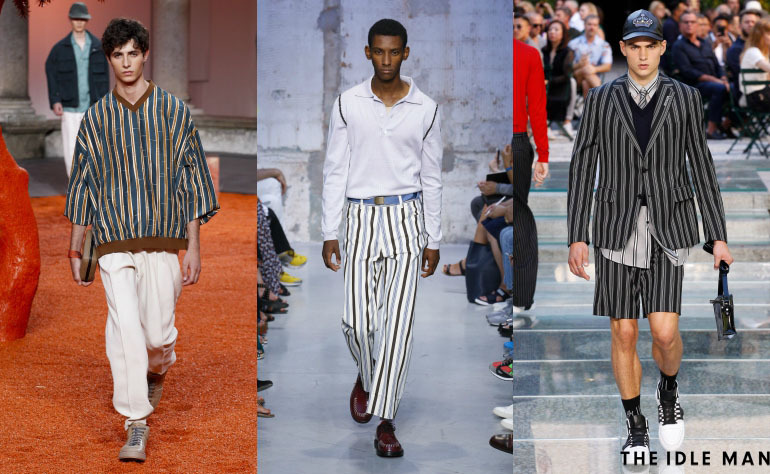 We saw plenty of vertical stripes at London Fashion Week Men’s and it looks like the trend has stretched over to mainland Europe. Marni, Versace and Ermenegildo Zegna all jumped on the trend and bid farewell to the old breton stripe. As menswear becomes more feminine, pastels are taking a key seat at the table. 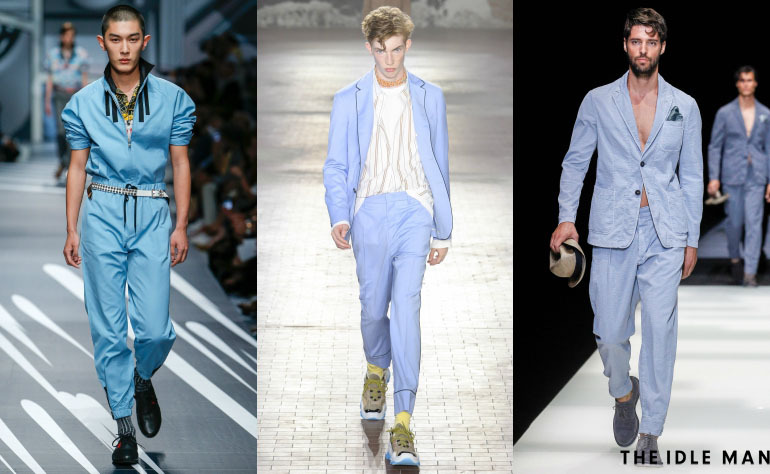 Giorgio Armani, Prada and No.21 were big on pastels, mainly with dusty shades of blue. If you thought that fashion’s obsession with the Nineties was over then think again! Diesel Back Gold gave us techno grunge leathers and biker jackets, Versace went right back to its Nineties roots with its bold patterns and high-waisted trousers, while DSquared2 gave us more grunge, plenty of attitude, Mapplethorpe-esque jackets and leather sleeves. Over the past few seasons check seems to having a moment in menswear, and it’s clearer than ever after the Milan shows that it’s becoming a certified menswear staple. MSGM, playful and youthful as ever, gave us giant checked pieces. Moncler slipped checked looks into its heavy outerwear collection, while No.21 gave a sophisticated take on how to do checked clothes. Vertical stripes, the Nineties and pink will all be the forerunning trends, while pastel blue and heavy checks will also be a staple for your wardrobe next spring. These will be your big trend all along this year.